The 12th Street Fighter 5 character to be revealed is Karin, who first made her appearance in Street Fighter Alpha 3. She joins Ryu, Ken, Chun-Li, Cammy, Vega, M. Bison, Birdie, Charlie Nash, Necalli, R. Mika and Rashid in the roster. According to Capcom, Karin Kanzuki polled as the 7th most anticipated fighter worldwide, and was the most anticipated in Japan. She's described as a "well-rounded character, possessing a wide array of strikes." A dash move helps her get in close, and her modular V-trigger can be adapted to outwit opponents. The opening strike "possesses over half a dozen different follow ups and variations. After the initial Guren Ken, she is able to transition immediately into an overhead attack, a low sweep, a flying throw, another quick set of strikes, or even a backdash to bait out counterattacks." The Capcom Fighters Network is also mentioned on the Playstation blog. It's a multiplayer suite built into SF5 that lets you watch replays, set up friend networks, designate rivals and absorb the latest tournament news. According to Capcom community manager Peter Rosas, "Street Fighter V will be at the forefront of our eSports activities upon release." The network will also keep tabs on your technique by counting your punches. "We wanted to make sure that players had access to all the statistical data possible to help analyze their weaknesses and improve their game." 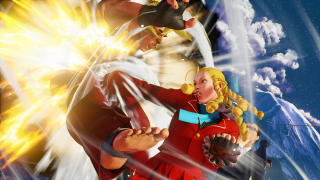 Street Fighter 5 will allow for cross-platform play across PC and PS4. A unifying network is a sensible way to bind the community, and hopefully it will make following and spectating tournaments easier. Here are a couple of work-in-progress CFN screens. Street Fighter 5 is due out early next year.